Having read various blogs and participated in several Facebook groups I have come to realise that many techies, or techie wannabes totally miss the point. Someone will post their complaint, and a lot of “answers” appear from various people. It seems we are all too quick to give a solution rather than discover what the actual error is. As with going to a doctor with a complaint of any sort, the physician will ask us questions, these questions are to assist in diagnosing what our problem is. He wouldn’t just dish out medication without first knowing what the root cause is. So the same should be for a technician. Some of us are all too eager to be the “only right one”, and arguments develop. This actually puts us techies all in a bad light, clients tend to shy away from people that are arguing, because to them that’s a sign of not know what you are doing. I also have fallen into this trap, arguing that my point is correct. So how do we diagnose? Surely there has to be a professional approach to PC hardware diagnosis and repairs? How long has this been happening, and have you had any problems before? What happened before this problem occurred? Keep it general and short, although some clients may “sound” like they are IT know-it-alls, in majority of the cases they are not. What we really don’t want to do is make our clients feel small, or stupid, or even insinuate that we think they are, even us IT pros make mistakes and need redirection! Once you have established a kind of camaraderie with your client and you have managed to glean some information about the history of the machine, you can now begin to do the more technical side of diagnosis. If the client has now left you with the machine and gone, you can now take it to the back (your workshop), after filling out a Job card with the client. YOU DO HAVE JOB CARDS DON’T YOU? Once you have the machine in your workshop, redo the same tests you did in front of the client, just to make sure. If you have one or two spare machines, test each component from the client’s machine in them to make sure that they are indeed working. After ascertaining which part is broken, make sure you have a similar part for replacement available, contact your client and quote them before you proceed with replacing. Some clients will just say fix it no matter the cost, still CALL AND QUOTE! Some techies have ALL the necessary tools to test which can actually save a lot of time, but as we have issues in Zimbabwe (currently) with getting these tools, which are mighty expensive for the right quality, I find that my method works smoothly. Normally if I am not able to find the right solution I rely on my network of friends who are all techies in different companies. Don’t try to be a “Know it all” ask a friend even if they work elsewhere! I know this as I was guilty of this myself in the past! I hope you find this useful. 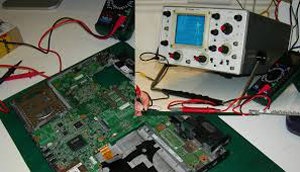 If you running your own hardware repair outfit what other approach do you use to offer professional service delivery? What tips and tools can you offer other techies? Please feel free to share below. Its all good if you have physical access to PC! Not a good idea to tell them that you dont use the machines, you only fox them. If you dont know the answer to a question they pose, simply say, “Let me do some research on that!” Its more professional! Any local suppliers for both devices? Nothing need fixing on a computer because the interconnect field replaceable units and peripheral devices just need replacement.